The Red Sox took two of three at home last weekend against the Oakland Athletics, who were one of the best and most consistent teams in the American League in April. Last at-bat heroics from Grady Sizemore (Tuesday in 12 innings) and Will Middlebrooks (Wednesday) earned Boston its first “sweep” of the season in a two-game set against the Reds in interleague action. The Red Sox begin a three-game series against the Texas Rangers tonight in Arlington. Writing for ESPN Insider, ZiPs projection system creator Dan Szymborski noted that at the beginning of the week, the Red Sox, Yankees, Orioles and Rays were projected to finish with 83 wins while the Blue Jays were on pace for 81 wins. As things stand right now, this could be the most exciting finish since the 1988 Morgan’s Miracle Red Sox. Among tight races, where does this possible one rank historically? Going through the million sims of the ZiPS-projected AL East final standings for 2014, the average standard deviation for the teams in the division is 3.27 wins. To compare this historically, I repeated this simple measure of spread for the top five teams in every divisional and league race going back to 1901 and found that, yes, this projects to be an unusually open race. The projections don’t take into account all the moves, demotions and promotions that these teams will make over the summer. Boston could go the route of bludgeoning its middling competition by dealing away a number of its prospects for somebody like Giancarlo Stanton. Or Ben Cherington may opt to ride it out with his solid core of veterans and hope that a handful of the youngsters provide the adequate complementary pieces for another title run. It’s becoming clear that Boston’s reported 4-year, $70 million offer to Jon Lester earlier this spring was nothing close to a beginning overture for where the negotiations will ultimately travel. Lester’s dominant 15-strikeout performance on Saturday rekindled the debate about his worth. Fenway fans got to see what six years and $100 million got the Cincinnati Reds on Tuesday night, when their “ace” Homer Bailey came into town and underwhelmed in battling Felix Doubront to a stalemate that ultimately took 12 innings to settle. Homer Bailey’s career ERA is 4.30, and he’s had two seasons in which he has thrown over 200 innings. He has not pitched to the level of a Clayton Kershaw, Justin Verlander, or even a Matt Cain. He’s never had any kind of a vote for the Cy Young Award, and has never been picked for an All-Star team. But Bailey has managed to shift perceptions in the market, when he got a six-year, $105 million deal from the Reds in February. To agents and players, this deal seems to represent a new benchmark that has ratcheted up their expectations. For some club officials, the Bailey contract represents one giant wrench dropped right into the middle of salary machinations. So if you’re sitting in Jon Lester’s position, as a star left-hander with two championship rings just five months from free agency, a $70 million offer from the Red Sox might appear almost ridiculous, within the context of the Bailey contract. 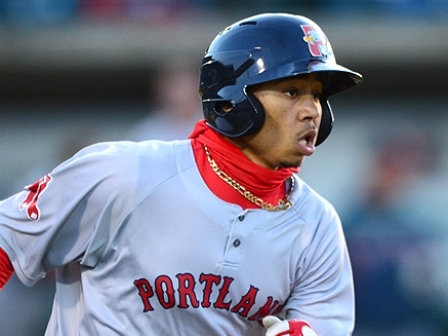 On Sports on Earth, Matthew Kory writes that Portland Sea Dogs second baseman Mookie Betts may be the most exciting player in the minor leagues right now. A year ago, Betts was in Single-A hitting .145/.340/.263. He had some on-base ability (nothing wrong with a .340 on-base percentage), but as a hitter he was rarely squaring the ball up and had no power to drive it when he did. He was just another athlete with few baseball skills, another small guy in a big man’s game. He looked overmatched. Had he been on any top prospect lists at the time (he wasn’t) that would have pushed him off. One year ago, Mookie Betts was an afterthought in Boston’s minor league system. … what he has done over the last 365 days (hit .360/.429/.557) is tremendous. … and this season, too. With Dustin Pedroia signed through the end of the decade, there is plenty of discussion already among fans and scouts about whether Betts could be a viable outfielder. While his value would be diminished if he were to move off his defensive position at 2B to go to right field, it’s hard not to selfishly hope the Sox try it out if it means he contributes to the club sooner. Perhaps the more intriguing option would be to trade Middlebrooks (look, he had a walk-off hit!) and explore moving Betts to third base. That option could create yet another dilemma with Garin Cecchini still regarded as a top-tier prospect, albeit one with a lot less power than what would be ideal for a corner infielder. Betts’ hot start is just another reminder that even as the big-league club hovers around .500 and underwhelms in the early going of the 2014 season, the organization remains in an enviable position with its depth and roster of exciting youngsters.